The Igloo Legend Beverage Cooler is fully insulated to keep all of your drinks cool and refreshing. It also allows for leak-free dispensing, with a recessed, double-gasket spout and lid vent allowing all liquids to flow freely through the spout. For your convenience, the cooler has an easy-grip lid design to allow for easy opening and closing and a swing-up handle for easy carrying and pouring. To aid with cleaning, the cooler also has a wide-mouth opening. lgloo are a worldwide leader in ice coolers, cooler bags, lunch boxes, and hydration systems. They offer quality, durable, and innovative products to keep your food and drinks cool whilst on your outdoor adventure. The Igloo Legend beverage cooler is fully insulated to keep all of your drinks cool and refreshing. It also allows for leak-free dispensing, with a recessed, double-gasket spout and lid vent allowing all liquids to flow freely through the spout. 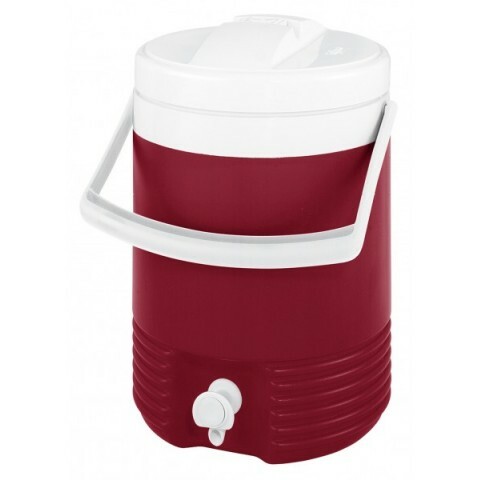 For your convenience, the cooler has an easy-grip lid design to allow for easy opening and closing and a swing-up handle for easy carrying and pouring. To aid with cleaning, the cooler also has a wide-mouth opening. Igloo are a worldwide leader in ice coolers, cooler bags, lunch boxes, and hydration systems. They offer quality, durable, and innovative products to keep your food and drinks cool whilst on your outdoor adventure.